We have already studied about causative verbs. We said that causative verbs are used when one thing or person causes another thing or person to do something. Or it expresses an action which is caused to happen. 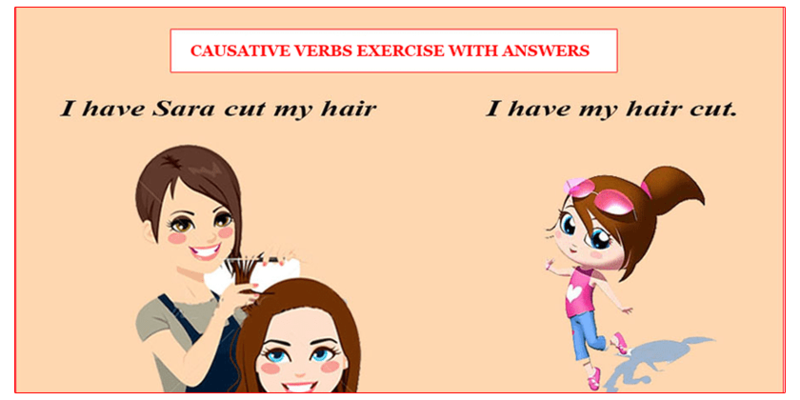 In the article below I cover Causative Verbs Exercise With Answers For Beginners. 1. Can you help me ______________ my living room next weekend? 2. My mom always makes me _____________ my room on Saturday mornings. 3. My little son wants us to let him _________ overnight at his friend’s place. 4. We had our landlord ________________ the broken window. 5. We got the computer guy _____________ the new software for us. 6. My friend lets me ____ his car sometimes. 7. I can help you _____________ into your new apartment if you want. 8. Your car engine is making some strange sounds. Why don’t you have a mechanic _________________________ at it? 9. Her parents don’t let her ___ out late on school nights. 10. Why don’t you let me ___ supper tonight? You can have a rest. 11. My boss made me _________________ overtime every day last week. 12. We should get Ben _______________ us some concert tickets when he goes to get his. 13. Why don’t you let me ______________________ you around our new house? 14. We’ve got to get our neighbors ______________ having loud parties every weekend. 15. I hope the teacher can help me ___________________ these math questions.